Nineteen of Dunaverty’s winter leaguers battled gale force winds and some heavy, freezing showers on the final day of competition. They turned out for the traditional Texas Scramble ending the six month fight. Five teams of three and one of four competed in the less than ideal conditions. Each member of the three man teams had to take four drives each and the four man team three drives each. Handicaps were based on 10 per cent of the total of the players in each team, There were nearest the pin prizes at the 7th, 10th and 16th holes. The first team out of: Alistair McConnachie, Alan Goddard and Bill Brannigan playing off 3.6 came in with a nett 62.4. 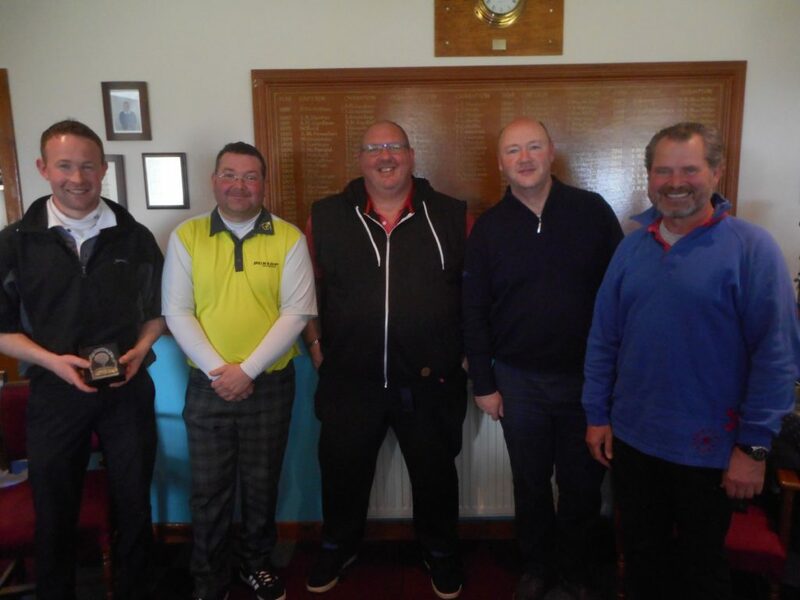 They were out classed by the team of Neil Brodie, Ken MacMillan and Robert Shaw, handicap 4.7, who returned a score of 60.3 and this proved to be the winning total. 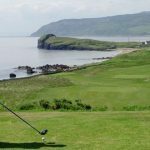 Texas Scramble Result: 1 Neil Brodie, Ken Macmillan, Robert Shaw 65-4.7=60.3, 2 Alistair McConnachie, Alan Goddard, Bill Brannigan 66-3.6=62.4, 3 Donald Brown, Robert Coffield, John Nutt, James McPhee 72-7.1=64.9, 4 John Brown, Danny Halliday, Jim Cooper 71-5.2=65.8, 5 Alex Arkell, David MacBrayne, Bobby Greenlees, 71-5.1=65.9, 6 Sandy Watson, John Marrison, Don Hardman, 71-4.2=66.8. Nearest the Pin: at 7th Alex Arkell, at the 10th John Brown and Sandy Watson at the 16th. Winner of the trophy for the six month competition was Alistair McConnachie by one stroke from Robert Coffield. This had been a seesaw battle throughout the event and Alistair clinched the win by virtue of a 45 point win in one of his rounds to Robert’s 44. At the presentation, new club steward Ailie Goddard, was thanked on behalf of the players, by organiser Bill Brannigan, for preparing a superb three course meal. Thanks also to Ken MacMillan who kept everything up to date with his statistics. Result: 1 Alistair McConnachie 197, 2 Robert Coffield 196, 3 David MacBrayne 192, 4 Don Hardman 191, 5 Alex Arkell 190.